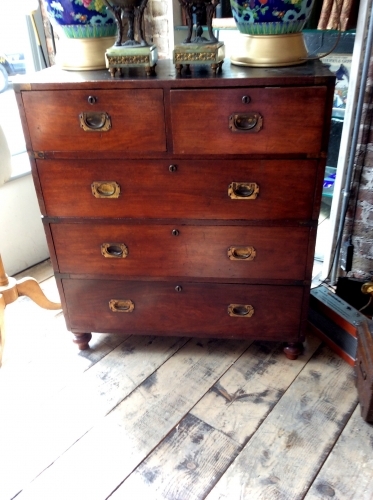 A Victorian campaign chest of drawers by Ross of Dublin, circa 1880, bearing inset label to drawer ‘ROSS &Co. Manufacturers 9,10,11 Ellis’s Quay, Dublin, and named for Major J.W.H Houghton R.A.M.C, with remains of paper labels,with two short and long long drawer above lower section with two long drawers, on bun feet, 103cm high, 91.5cm wide, 46cm deep. E.Ross is listed in 1855, in The Dublin Street Directory as “army cabinet furniture, portmanteau, and camp equipage manufactory” at 9, 10 and 11 Ellis’s Quay. Nicholas A. Brawer, British Campaign Furniture Elegance Under Canvas 1740-1914, Harry N. Abrams Inc., New York. 2001. ~~~ A Great War D.S.O. Group of Eight to Colonel J.W.H. Houghton was sold at Spinks, Orders, Decorations, Campaign Medals and Militaria, 17th April 2007 where his biography read as follows:- Colonel John William Hobart Houghton, D.S.O. (1876-1959) born Kensington, London; M.B. BCh Dublin 1898; commissioned Lieutenant Royal Army Medical Corps, 1899; served during the Boer War (1899-1902) and was present at Spion Kop and Pieters Hill; Captain 28.1.1902; D.P.H Dublin 1903; served in Sierra Leone, 1907-09; Major 28.10.1910; appointed British Red Cross Commissioner, attached Greek Army in Macedonia and Epirus for the Turco-Balkan War, 1912-13; he commanded one of the two Red Cross units sent out, his being stationed at Vodena; served during the Great War from, 26.9.1914; Lieutenant-Colonel 1.3.1915 (M.I.D. London Gazette 24.12.1917); served in Bermuda, 1922-24; Colonel 26.12.1923; retired 1927.